Some people prefer holidays somewhere between palm trees and the beach. 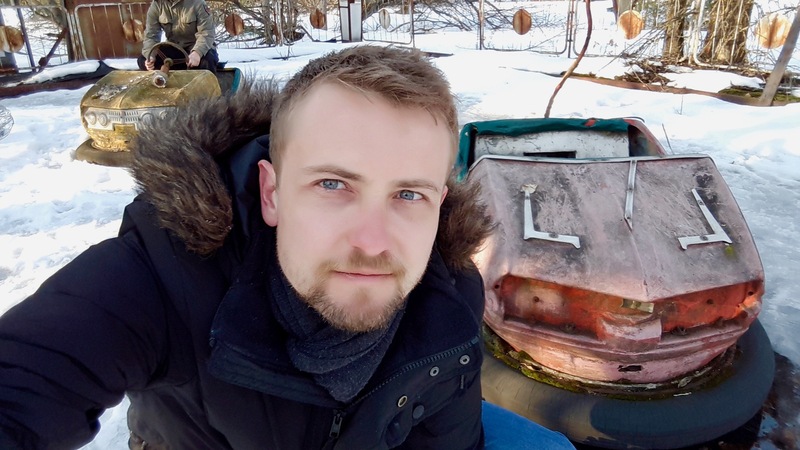 Mirco (35) went to Chernobyl instead – tracing world history. He is a German traveler and works as a teacher for French and Politics in Hamburg. In 2018, he went on a Chernobyl day tour. In the interview, he tells us about his experiences and feelings on a Chernobyl day tour with strict Ukrainian security controls, sensation-seeking drunk tourists, abandoned radioactive pets, remaining dangers of the Nuclear Power Plant and time traveling into the year 1986, when the area around Chernobyl became an abandoned restricted zone after the Nuclear Power Plant catastrophe. 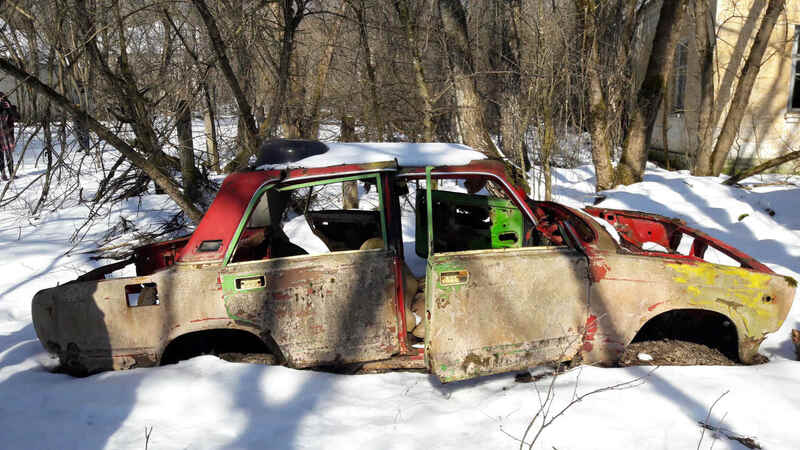 You have been sightseeing in Chernobyl with a tour group – Can you go there by yourself at all? No, you have to organize a visit to Chernobyl properly in advance. It’s not possible to decide spontaneously in Kiev: “Let’s go to Chernobyl.“ That’s legally not possible. Your passport gets checked in your country of residence even before you start traveling to the Ukraine. If you want to plan a visit of Chernobyl, you need to look for a tour operator and send him a copy of your passport. He will sign you in. The interesting thing is, that the Ukraine immigration officials at the airport know about your travel destination. On arrival, you might be greeted with the words: “Ah, Chernobyl!”. Why all the security checks? What is the Ukrainian government afraid of? It is probably afraid of terrorist attacks. It’s possible to cause a catastrophe in the area around Chernobyl. Just imagine the radioactive contaminated woods to start burning and to release radioactivity. That would be the next historical drama. That’s why every person traveling into the restricted zone around Chernobyl gets checked intensively. There are also strict rules about what you are allowed to do and not allowed to do in the restricted area. What is not allowed for visitors? The Nuclear Power Plant is still there and gets deconstructed. If you are close to the Nuclear Power Plant, it is for example very important to take pictures just from a certain legal perspective. Our guides told us, that you will be in big trouble, if pictures taken of the “wrong” side will show up on Facebook. There is a central lookout in front of the sheltering sarcophagus of the Chernobyl Nuclear Power Plant. And this lookout is one of the stops of the Chernobyl tour. 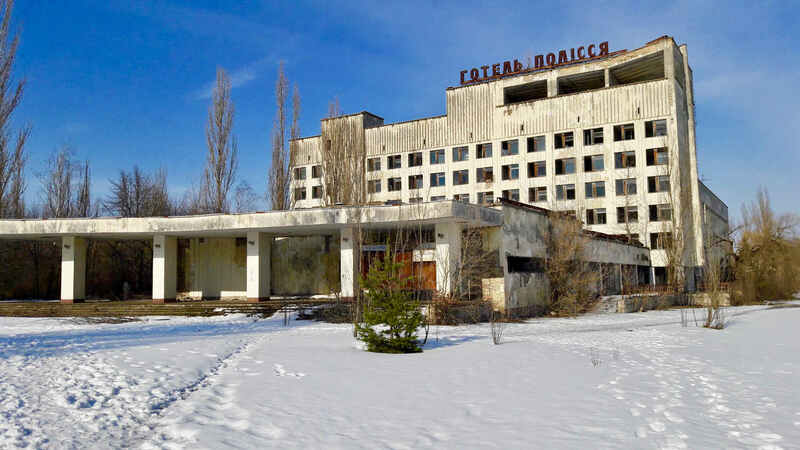 Is Chernobyl a place of mass tourism or a rather lonely experience? Being on a Chernobyl tour is nothing to be called exotic. Of course, it sounds slightly bizarre for us to go there. But you won’t be alone in Chernobyl. Already while planning your Chernobyl tour, you will notice the huge number of Chernobyl tour operators with a variety of different travel options. Most tourists opt for the Chernobyl day tour. But you can also travel into the restricted zone for two days or even a whole week and sleep in a hotel in Chernobyl. The hotel is really open to the public again. What happened on your Chernobyl tour exactly? I did a Chernobyl day tour. It seemed as if I had taken one of the oldest and most successful tour operators. At least, the company got the best reviews. My travel group consisted of 50 participants driving in a big comfortable Ukrainian bus. The big bus was for the English-speaking tourists. For the Russian or Ukrainian-speaking tourists, there was a separate tour. But I just saw five to ten participants of those tours – going there on a Sunday. My tour was perfectly organized – strictly and efficiently. Our two tour guides were well-informed and used clear words towards the group. Of course, there is always a risk to have the odd bizarre traveler on board. 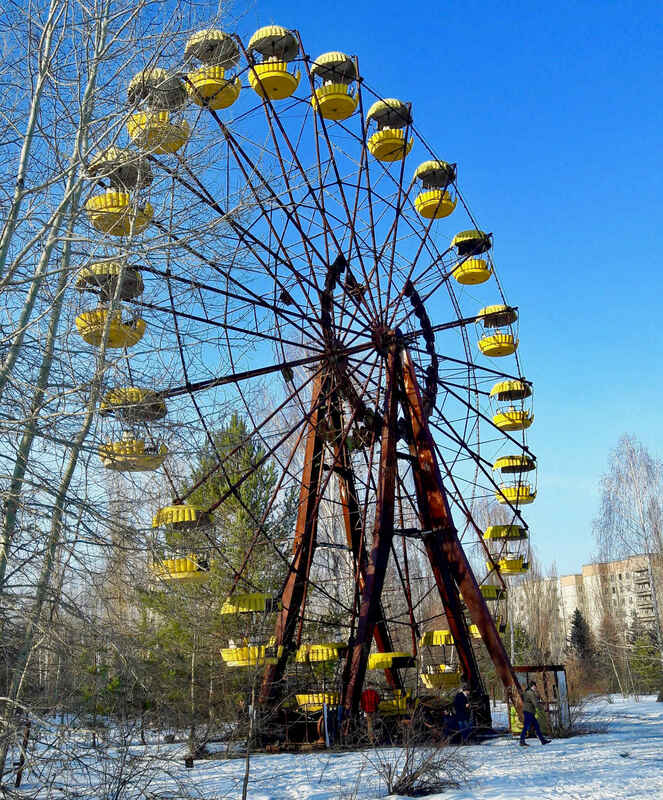 Are there embarrassing sensation-seeking tourists taking part in Chernobyl tours? They definitely exist. But on my tour, I experienced them to be a minority, A few tourists were already drunk, when we started the tour. In general, drunk people are not allowed on the tour. But the tour guides reprimanded these people in a harsh way when they didn’t act appropriate in the restricted area. The tour guides threatened the drunkheads quickly with the exclusion from the tour and immediate return transport. I was shocked about how serious the tour guides seemed to be about their words. But it helped. Everyone behaved. Who else took part in your Chernobyl tour? Tourists from all over the world took part in my tour. Old couples from Germany, young backpackers, individual travelers. Probably, I wasn’t the only one having difficulties to find a travel mate for a holiday trip to Chernobyl. I had lunch with guys from Venezuela, the USA and Ukraine. How did you feel in the bus to Chernobyl? Afraid of radioactive contamination? I was not afraid to get radioactively contaminated. I read a lot about that subject in advance. All international environmental organizations and also the tour operators declared traveling to Chernobyl to be safe. Even the physics teachers at the school, where I work, assured me, that the radioactive particles have seeped deep enough into the ground not to be hazardous anymore. That’s how I experienced the situation in Chernobyl. In spite of that, it is not the same feeling than going on a sightseeing trip to the Colosseum in Rome. 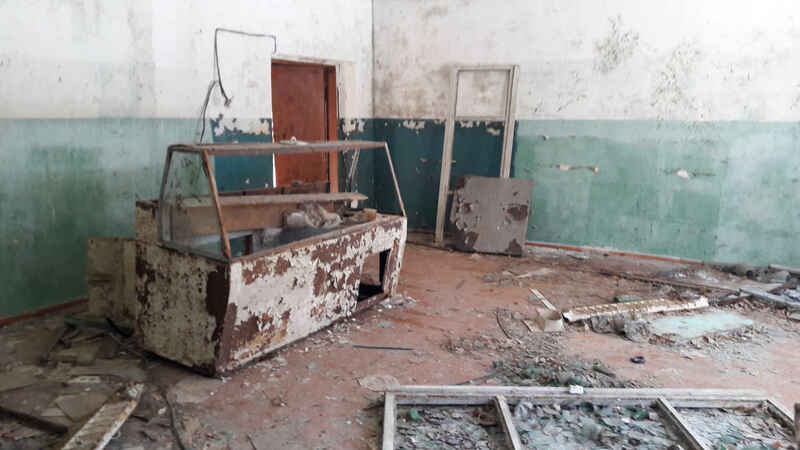 One of the reasons might also be, that on the 1,5 hours long trip from Kiev to the 30 kilometers long restricted zone around Chernobyl, you get prepared by the tour guides with videos and explanations to understand the things, that you will see in Chernobyl. The Ukrainian guides also spoke about their childhood memories of that time, which made the experience more intense and authentic. I also started to feel somewhat queasy, when they spoke about the rules of behavior in Chernobyl. What are the rules of behavior on a Chernobyl tour? If you find fruits, don’t eat them! There is another really exiting fact: The city of Pripyat close to Chernobyl had been evacuated right after the Nuclear catastrophe. But all the pets had stayed at home. In the flats. The people were not allowed to take their dogs to safety. Soldiers had been sent to the area aferwards to shoot the dogs. Some survived. Nowadays, you see the descendants of these pets everywhere around Chernobyl. They are super cute. Once a pet – always a pet. Even three generations later. That means: Everywhere at the sightseeing tour stops, dogs are running around happily tail-wagging expecting you to love them. The problem is, that you shouldn’t touch these animals, because it is probably not clear, whether they carry an increased level of radiation in their fur or if they were digging with their paws in contaminated ground. That is probably really sad to see the abandoned pets in Pripyat? Yes, that is sad. But the guides also told us: “You will see us playing with the pets in spite of that”. Many tourists behaved the same way, because the cats and dogs are very cute and want to play immediately. We used our Geiger counters to measure their radiation. The ones, that we saw, didn’t radiate. So, we also stroked them. Can you describe the Chernobyl tour a bit more in detail? Is there anything in particular, that impressed or touched you? There are several stops on the tour. The first stops are the abandoned villages just after entering the restricted zone. I felt like being in ghost towns. Ghost towns like this also exist a lot in the USA. Nothing more than abandoned houses. You were still able to feel the Soviet style. Time is standing still there. In the houses, we saw calendars of the year 1986. You see pictures of hammer and sickle. In the first village, there was a community building with a special saying on the wall: “Communism is the way into a radiant future.” Radiant in terms of glorious. That’s extremely ironic. Of course, no one knew before 1986, how ironic these words will sound one day. There is another stop at the Nuclear Power Plant. I had lunch in the canteen of the Nuclear Power Plant. The main stop is in the city of Pripyat three kilometers away from the Nuclear Power Plant. I considered it to be the most interesting stop of the tour. What was special about Pripyat? Before the catastrophe happened, the city had 50.000 inhabitants. It was the place, where the workers of the Nuclear Power Plant lived. In 1986, it was an example city, an object of prestige. The living conditions were a lot better than in Kiev, Minsk or in the rest of the Soviet Union. Pripyat was a town for a selected elite. We visited for example the abandoned fairground, which was meant to open just shortly after the catastrophe. It didn’t happen anymore. Apart from that, the big city consists of long roads of abandoned decrepit apartment blocks, a few former cultural institutions, a cinema, a train station, a hospital and a hotel. You can walk around there. It will remind you of documentaries, that show the world without people. There are already people living again in Chernobyl, right? Yes. 10 or 15 years ago, people started to return to their houses in Chernobyl. Back then, it was still definitely not allowed to go there. Now, it is a bizarre town with abandoned and occupied houses. And the government started to provide electricity in Chernobyl. So, it must be common knowledge, that there are people living and moving there again, even if you shouldn’t do that. The town itself wasn’t the worst contaminated place after the explosion in 1986. A lot of radioactive material got released into the atmosphere and got carried away. Especially the area around Gomel in Belarus got extremely contaminated. Within the 30 kilometers long restricted zone around Chernobyl, there are different levels of contamination. Is a Chernobyl tour safe? Is it dangerous for your health to go on a Chernobyl tour? There are things, that you are not allowed to do for your own safety. It can be a problem to stay a long time in a contaminated close by forest. The tour guides called it the Red Forest. We also used Geiger counters on our way. You can order one for 5 US Dollars beforehand. But that’s just for a fun effect. Experts have already checked the ways used by the tour groups. So, we were constantly walking on safe roads. Concerning the amount of radiation intake, my flight from Frankfurt to Kiev was probably worse than the Chernobyl tour. Which thoughts and feelings did you take home from your Chernobyl Tour? Pity with the people, that have lived there in 1986 and who died directly in that place or after a few years under dramatic circumstances. Pity with the people, that have been put into the hazardous situation without knowing it. Pity with everyone, who needed to escape or had to be evacuated. That the one thing. Moreover, you get a feeling of Armageddon. And you ask yourself: How are people dealing with Nuclear Power today? After I went home, I did some research about when the last Nuclear Power Plant in Germany will get closed. It will still take some years. Apart from that, I considered my trip to Chernobyl an enrichment. Some people might ask the question: Is it appropriate to go on a trip to Chernobyl? Did you ask yourself that question? I was thinking about that beforehand. And I got different reactions from people, that I told about my plans. But what we shouldn’t forget: It all happened 30 years ago. It’s not such an emotional subject anymore. Moreover, it’s not super cheap to go there. 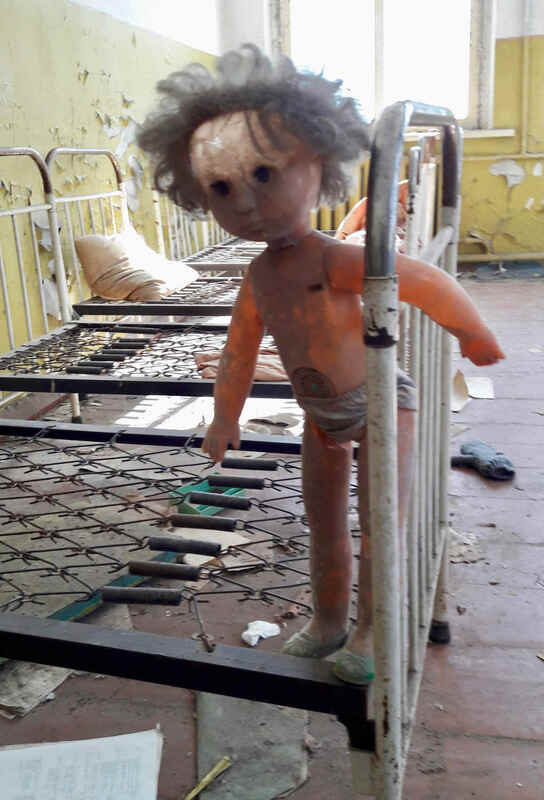 A one day tour to Chernobyl costs around 100 US Dollar per person. That’s around 80 Euros. When you keep in mind, that the average wage in the Ukraine is less than 500 Euros per month, than you know, that the Ukrainian Government gets a lot of money out of this. As far as I know, this money goes to the still existing Chernobyl aid organizations. A lot of people still suffer from long-term health effects. There are still victims, that suffer from problems of resettlement. All these people get quite a bit of money out of, what tourists pay for the tour. What do you think is the appropriate behavior on the tour? Be respectful and don’t show up on the Chernobyl tour drunk. But I think, that it is totally okay to inform yourself about a part of our world history. It makes you think about how humans use technology. It can’t be bad to think about questions like this. The Chernobyl tour is not about sensation-seeking tourism. The tour operator tried to handle the whole subject from a scientific perspective. Most travelers don’t fly around the world to see Chernobyl. How can you logically put Chernobyl on your travel itinerary? I visited Chernobyl, Minsk and Kiev on the same trip. Kiev is a beautiful city with typical Eastern European charm. It’s the starting point for the Chernobyl tours. Plan at least three days in Kiev to cover the city and Chernobyl. It a great stopover on a tour across Europe. In contrast to that, it is difficult to enter and leave Belarus, if you don’t have the right nationality or the right visa in your passport. Since 2017, travelers from 80 countries including the entire European Union, Brazil, Indonesia, the USA, Japan, and other countries can use president “Lukashenko’s Five Day Rule” to enter Belarus, but only via the airport in Minsk, not overland. Minsk is therefore not the right city to start a trip to Chernobyl. Thanks a lot for the interview! Traveling around the world is my passion. On www.travel-steps.com, I'm writing about my backpacking trips with all ups and downs.